3 important key takeaway from Amazon to improve productivity - There is no free lunch, 2 pizza rule, 6 pager narrative. You might have read many articles about Amazon, or even the book about Jeff Bezos - The Everything Store. What are the key takeaways for you? 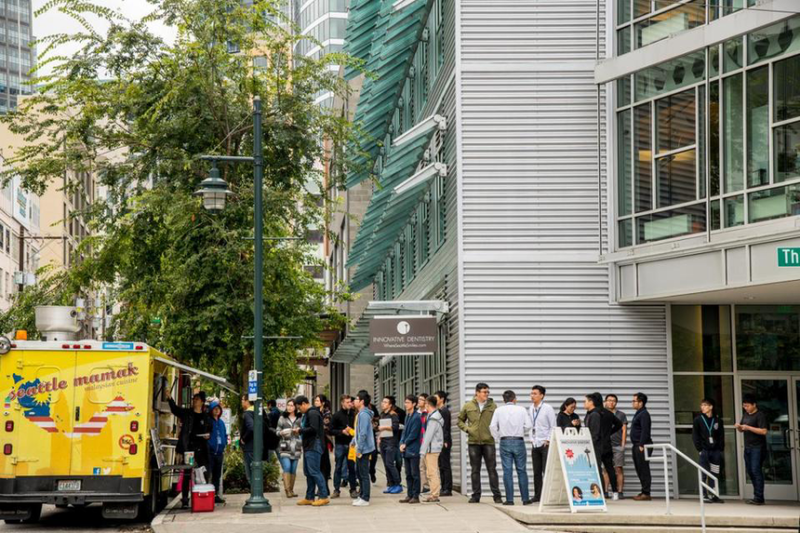 If you have been to South Lake Union (Seattle), there are long lines for food trucks during lunch time. There is where Amazon HQ located and yes, those lines are formed by Amazon's employees. There is neither 5-star chef, nor free lunch provided by Amazon, a huge contrast with other Internet giants like Google, Facebook & co. Besides being known for its frugality, it is important to understand that Amazon is not just a pure Internet company but its staffs range from brilliant engineers to warehouse workers. Amazon has always come under fire for its treatment of its employees but say if you are Jeff Bezos, what would you do? Free lunch for the engineers but not the warehouse staffs? So as an employer or employee, does free lunch or perks work for you? Is it important? What we can be certain though, frugality is an important DNA for businesses to achieve sustainability, growth and longevity. Let us start with the "Microsoft Syndrome" in the early days. Meetings at Microsoft were known to have dozen-plus attendees, focusing too much on the integration of their money-making products - Windows and Office. With more than a thousand software engineers in a product team, with too many hierarchies, "70% talking or managing, 30% working" culture was taking shape at Microsoft. It was Microsoft's big company syndrome, the neglection of cloud products that allowed competitors like Google and Apple to eventually eat up their market share. Many technology companies have learnt from Microsoft Syndrome by decentralizing the company and teams, smaller teams. 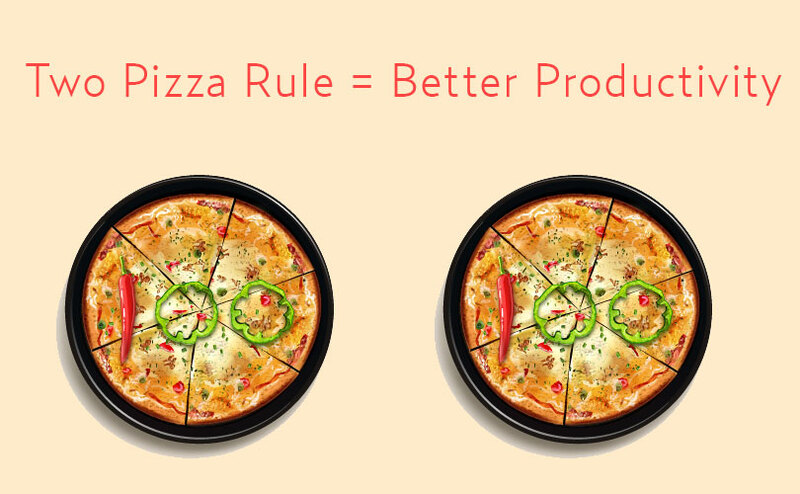 Jeff Bezos took it further by famously establishing a "2 Pizza Rule" - never have a meeting or even team where two pizzas couldn't feed the entire group. Fewer people helps a meeting to move a lot faster, meetings are only held whenever necessary. It is Amazon's productive mindset that shapes "30% managing, 70% working" culture. You might get used to going into a meeting presenting, or being presented a slideshow. However, this is not a norm in Amazon's office, they usually start with a 30-minutes silent reading of a 6-pager memo that thoroughly explains a topic. 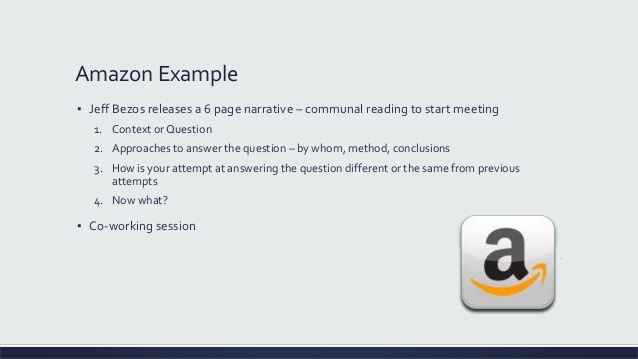 In Amazon, PPT is considered a lazy way to prepare a meeting without deep thinking. It is easy for the presenter to prepare, but difficult for the audience to fully digest the topic as PPT might not cover enough context in terms of data and figures. With narrative format, employees are encouraged to dive deep into the topic and write in detail, not just bullet points. All angles are expected to be covered so that questions triggered while reading the report are answered in the 6-pager narrative. Meetings are more productive, employees are trained to improve their clarity of thought on top of language and writing skills. As for Amazon, all written contributions in the form of proposal, memo, report are being well documented so this is one heck of an archive.